THE first big event of the rock'n'roll calendar, the Rockers Reunion at Reading, proved that when it comes to rock'n'roll, poor weather, recession, and post-Christmas blues will not keep the fans away. A near capacity crowd poured into the vast Rivermead Centre to take in a sparkling bill that included American visitor Sleepy LaBeef, UK Rock Magazine favourite singer Mike Sanchez, the crowd-pleasing Lucas and the Dynamos, fast rising Teddy Boy band The Rhythm Aces, the ever popular Skyrockers and three piece openers Katz Astray. Even before the doors opened, the hall was abuzz with energy as stallholders set up the length of either side of the hail, and the magnificent sound system was put through its paces. Katz Astray was precisely the right band to warm things up as the lengthy queue shuffled in past tight security, and everyone was in position to hear The Skyrockers, with their refreshed four piece line-up, proving it was rocking as usual with numbers like Tore Up, Little Queenie, and Boogie Woogie Country Girl, with the added attraction of a few from their current CD. The now-seasoned Rhythm Aces mix Teddy Boy favourites like Please Don't Touch and Brand New Cadillac with numbers from their debut CD, reviewed in these pages this month. Pete, Howie and Noz always look the part and deliver the goods. A faultless performance. As a sometime Sports Centre, the Rivermead decided to do its bit for our health by declining to supply the £5 all day breakfast in the restaurant which has previously been a best seller despite all the makings being present. They also refused to allow access direct from the restaurant to the hall, forcing fans to run through the rain to get back into the main hall. Thanks, Rivermead. But this failed to put a damper on proceedings as the front of stage area filled again for Mike Sanchez and his band. That he is the UK King of sax and piano-led rock'n'roll was proved again, as he blasted through Sapphire, Lights Out, I'm Ready, pausing only slightly for Brook Benton's Hurtin' Inside, and his Mum's favourite, the Jim Reeves nugget Blue Boy, before picking up the pace again for Geraint Watkins/Dave Edmund's Deep in the Heart of Texas, Rocket 88, Real Wild Child and Brand New Cadillac. The management of the show are to be complimented on laying on a blonde Liz Fraser lookalike for stage invasions, and she led a quartet of dancers who just added to the atmosphere. Carry On Invading! Then, Mike added to the variety with a maraccas-shaking Hey Bo Diddley, segued into Brown Eyed Handsome Man before the climactic Tallahassee Lassie, which topped the Freddy Cannon original by a margin. He is a showman and complete master of his craft. The Human Jukebox, man-mountain Sleepy LaBeef was up next, and woe betide a lesser group than the hand-picked backing crew Wayne Hopkins had put together as Sleepy went directly from one number to the next without pause, with little warning of tempo or key changes. That they kept up is a credit to them, and they made him look good as he cherry-picked from his 5,000 song repertoire of rock'n'roll, rockabilly and country material. He opened with Honey Hush, and played so many numbers during his set, my pen ran out of ink. Certainly, they included Jimmy Reed's Big Boss Man, Diddley's Ride on Josephine, and Bo Diddley'sa Gunslinger, and, for contrast, country numbers including Four Walls, Blue Moon of Kentucky and Waltz Across Texas. He went down a storm. To finish, Lucas and the Dynamos, in jackets as brilliant as their music, proved themselves human dynamos, never standing in one spot on the stage for more than seconds. Rooted in the styles of Haley and Bell, they bring fun to rock'n' roll with numbers like Razzle Dazzle, and Midnighter, together with some of their original material. There's no better party band, and no better way to finish off this superb event. Well done to organiser Ian Wallis. For more background on the Rockers Reunion, you can download these jpegs of newspaper articles on past parties. Some pictures from the 2003 party are here! For the past two decades the annual pilgrimage to the Rockers Reunion has become a regular feature on the calendar for Rock 'n' Roll enthusiasts, motor cyclists and Teddy Boys. The event was founded in 1984 by Len Paterson as an attempt to get together as many as possible of his old mates who had grown up during the mods and rockers era of the sixties. In those days they had shared a passion for British bikes, boozing and the occasional rumble on the seafront at bank holidays. With the passing years, the old gangs have been split up by the usual combination of mortgages and kids, so the idea of Rockers Reunion was to bring together again many of the old comrades who had lost touch with each other. The first Rockers Reunion was held at The Clarendon, Hammersmith and proved to be an unqualified success. Rock'n' Roll music was always going to be the central theme so Tony Vincent's CSA and Chris Black And Black Cat, two of the most popular rocker bands of the period, were booked to provide the entertainment. It was such an emotional night that everyone insisted on a repeat the following year and this time Crazy Cavan And The Rhythm Rockers, The Wild Angels and Brian Poole ensured a night to remember. 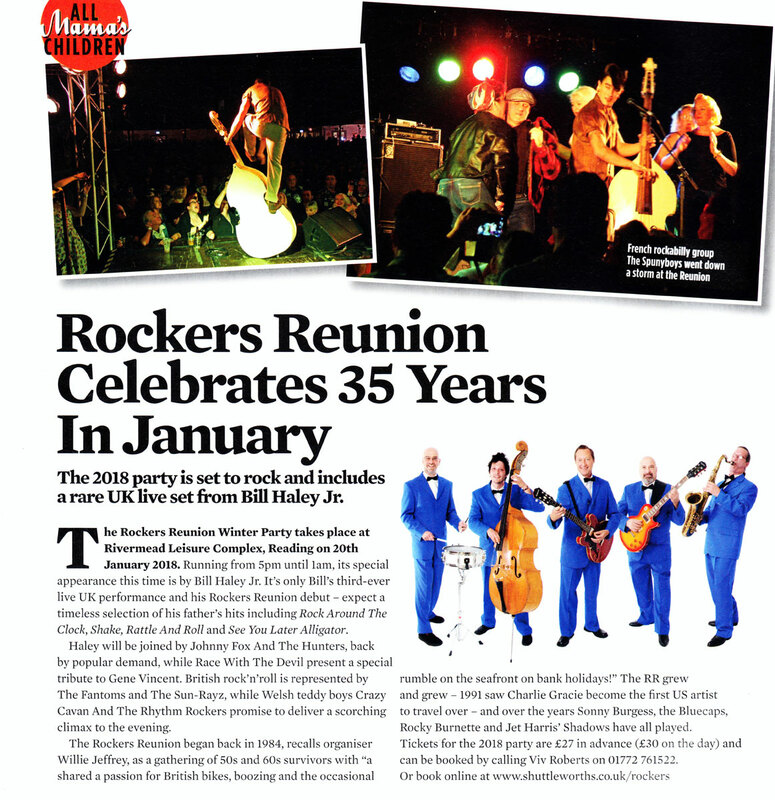 After three years in Hammersmith, Rockers Reunion transferred to the larger and more suitable venue of The Old Battersea Town Hall where it would remain, with the exception of one year at Wimbledon Town Hall, until 1996. The beer consumption at the Rockers Reunion became legendary and Youngs Brewery at Wandsworth viewed it as one of their premier events each year. During those early days a whole range of British Rock'n' Roll acts appeared at Rockers Reunion, some of the most memorable being The Rapiers, Mike Berry And The Outlaws, The Riot Rockers, Matchbox and Freddie Fingers Lee. One band however became synonymous with Rockers Reunion. CSA, who had appeared at the first Reunion, proved so popular that from 1987 onwards they became a regular fixture every January. In 1991 Charlie Gracie became the first American Rock 'n' Roller to play Rockers Reunion and amazed the capacity crowd with his sheer professionalism. A year later the great Jack Scott travelled from Detroit to Battersea to top the bill on a most memorable night. Other acts who kept the beer drinkers away from the bar in the early nineties were The Houseshakers, Class of 58, The F!ames and Black Cat, not to mention the hilarious antics of the never to be forgotten Royal Liberty Morris Men. In 1994, Rockers Reunion's founder, Len Paterson decided that his business commitments no longer allowed him time to organise the annual get together so he announced a final Reunion, his eleventh, which featured Lonnie Donegan Crazy Cavan and John Leyton, plus of course the ever popular CSA. 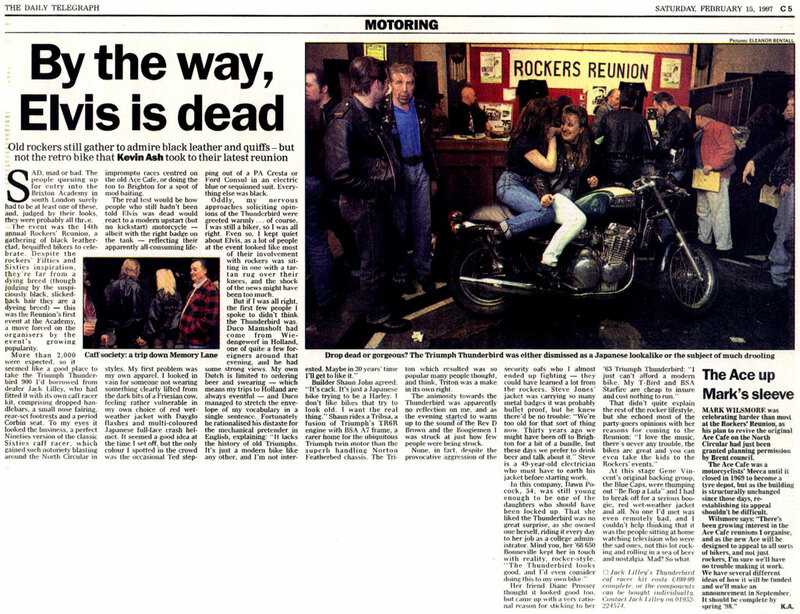 After much speculation, Willie Jeffery and lan Wallis took over the reins from 1995 with a policy to keep Rockers Reunion the same potent mix of Rock'n' Roll, motor bikes and beer, but if anything to raise even further the quality of the entertainment. They filled Battersea Town Hall to overflowing with a line up which included Johnny And The Hurricanes, Wee Willie Harris, Jet Black, Lucas And The Dynamos and The Rapiers but sadly the death of CSA's front man Tony Vincent in July 1994 had brought their involvement to an unexpected end. The following year Sonny Burgess, Crazy Cavan, Bert Weedon and Twinkle proved such a strong draw that plans were formulated to try and find a larger venue because the walls at Battersea Town Hall were starting to bulge. For one year only in 1997 Rockers Reunion re-located to the Brixton Academy. It provided the necessary capacity but not the atmosphere so the experiment was short lived. Nevertheless the appearance that year of Gene Vincent's 1957 BlueCaps was another unforgettable event. British cult hero instrumentalists, Nero And The Gladiators specially re-formed for the occasion and were brought on stage dressed in traditional Roman togas and carried by a specially hired Roman chariot. Other names from the annals of British Rock 'n' Roll who participated in what was now being affectionately known as 'The Piss Up Of The Year' were Joe Brown And The Bruvvers, Danny Rivers, Terry Dene And The Dene Aces plus the original hit line-up of Matchbox, but in the year 2000 the decision was taken to move the Event away from London and the last three Rockers Reunions have been held at the spacious Rivermead Leisure Complex in Reading. It took a little time for the audience to adapt to their new surroundings but happily headline acts like New Orleans piano pumper Frankie Ford, a return appearance by Rockabilly legend Sonny Burgess and a show stopping set by Rocky Burnette and Paul Burlison made the transition as smooth as possible. The tradition of including a vintage British Rocker has been maintained by the inclusion of Tommy Bruce, Moontrekkers and Graham Fenton. On 18th January 2003 Rockers Reunion will celebrate its 20th Birthday at Reading with another line-up of acts guaranteed to maintain the usual high standard. New York's Rock'n' Roll bad boy Robert Gordon will headline. He seems like an ideal choice having been star of the cult motorcycle movie,'The Loveless' and certainly anybody who has not previously heard Robert's incredible voice on a live show is in for a very pleasant surprise. The sound system at Reading is among the very best in the country and if the Houserockers can duplicate the standard of backing that they provided for him at Hemsby in October 2001, it will be some show. British Rock 'n' Roll will be represented by The Riot Rockers, The Skyrockers, Jelly Bean, The Houserockers and Jet Harris's Shadows, also featuring keyboard player Cliff Hall. Jet was one of the sensations of the Reunion in January 2000 and his return is very much by public demand. 20 years is a long time for any music event to survive but Rockers Reunion has flourished very much through staying the same. It still attracts the motorbike enthusiasts and the old Teddy Boys along with lovers of good Rock 'n' Roll music. Extra bar staff are being trained up ready for the occasion because Rockers still drink the most and that after all is what you expect from 'The Piss Up Of The Year'. I don't know why, but I had not seen Janis Martin before. I know she has visited these shores quite often, but events always contrived against me to ensure that I was unable to see her. Not a problem for some, but for me...someone who actually loves the albums, a hit of a annoying hindrance! The Rockers Reunion was the place where we were both finally to see our respective paths cross and I will regard the moment as one of the highlights of my life. rock n'roll festival should be. There is a place for everyone and the crowd reflect a good cross section of the rock n'roll scene. Loads of leather clad rockers and bikers, drape suited teds and a fair smattering of rockabilly types. The mask also reflected the serious tastes with out and out rockabilly, rock n' roll, mixed in with a fair amount of strollers and jive/dance numbers. Everyone is happy and there really aren't any conflicts. There was even a cleverly designated dance area highlighted by a spotlight where the jivers could do their thing without interfering with those that like to gather in front of the stage The music too shows a variety that keeps everyone happy. Fever and Johnny Fox backed by the superb Houserockers all warmed op the crowd nicely. The fact that this was Johnny Fox's last "big show" performance obviously attracted people he certainly came up with the goods to keep them content with a range of numbers across the rockin' spectrum. Fever are a relatively new band from Essex I had not seen before, and whilst they are learn ing their craft they have obviously made a impression to be on this show. Their perform ance here will do them so harm at all and there were many that were very impressed. Another new band, for me, at least were The Blue Jays. Very much a Shadows type, instrumental British rock n'roll type band, they looked the part, all in identical suits and their playing was light and precise. Judging by the reaction of the crowd, they are popular as well. Although not my sort of thing (I can never seem to disassociate this type of music with the interval in the cinema! ), they did what they did well, and will be popular with many. In between acts there was a chance to browse through the many stalls or just dance away to the music, supplied by the two Pete's, Wilcat and Bruce. Both of course keeping the punters happy in their own inimitable style. Next up were Cat and the Hot Tin Trio, a band that I unfortunately missed at the Prince of Wales (Strood) recently. So here was my chance to catch their action and goodness gracious me, there did seem be a lot of male interest in Cat, the lead vocalist. Could this be because she was clad from head to foot in a figure hugging black leather look suit or because they loved her voice? I will let you, the reader decide! Despite the aesthetic attractions of the lady in question, the band sounded good and certainly got the crowd going. I look advantage of the next break to sample some of the food on offer and unfortunately made the poor choice of going for a bog standard cheeseburger. I'm afraid that's about the right description this should have gone straight into the bog! I feel sorry for the regular patrons of the Rivermead Leisure complex in Reading, if this is the sort of fare that they are subjected to throughout the year. I cannot remember when I last attempted to eat a cardboard cheeseburger or an uncooked sausage roll, but you can be assured it will be a long time before I do so again. Thankfully the coffee was drinkable! For some reason, Janis Martin, although given headline status on the flyers, was only second on the bill, but she was who I had come to see and she didn't disappoint. The voice hasn't suffered over the years and backed by the Houserockers, Janis went through the catalogue of her best known numbers. "Crackerjack", "My Boy Elvis", "Drugstore Rock n' Roll", they were all here included and it was thrilling to see her relaxed style .... she created a good rapport with the crowd and I doubt if anyone was disappointed. Afterwards, she came to meet and greet and signed autographs for anyone that wanted them, and there were a lot, for nearly and hour and a quarter. I was lucky enough to get a quick chat with her, and an autograph, and can tell you that she is a wonderfully sincere and pleasant lady. A true professional. Last but by no means least, the reunion was headed by Crazy Cavan n' the Rythm Rockers. I had not seen them since the late 1970's so was at least interested to see what the passing of the years had done to them. The answer is not a lot, at least not musically. All the hits (sic) were trotted out, to the delight of the majority of crowd, who had gathered in front of the stage to pay homage. There were a couple of numbers that I had not heard before but mostly it was familiar ground. They are perfect for the Reunion, the rockers love them and they still attract a crowd. Perhaps not entirely to my personal taste nowadays, but you can't knock them for their durability and they are obviously very popular. So all in all, a good Reunion highlighted for me by the appearance of Janis Martin. A great start to the rockin' year!